BedInABox Tranquillium Mattress Review - Will Memory Foam Help You Sleep? Today I’m going to be taking a look at the Tranquillium mattress, one of several models from retailer BedInABox. 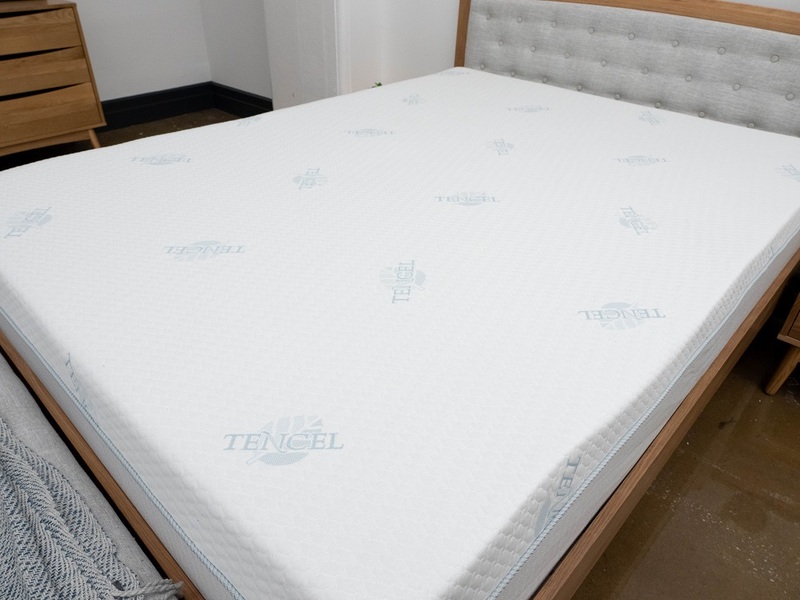 While all the brand’s beds are built with memory foam, Tranquillium differs from the pack in that it features a breathable Tencel cover and is billed as the line’s “firm” model. Now that’s all fine and good, but is the bed actually comfortable? To find out, I’ll be putting it through my tried-and-true tests to assess its unique feel and figure out if it just might be the perfect mattress for you! Continue reading below for my full review of the Tranquillium mattress. Don’t have time to read it all? Click here to skip to the bottom and check out my review summary. Firm yet breathable, the Tranquilium mattress from BedInABox could be great for a wide range of sleepers. The Tranquillium is outfitted with a two-layer foam construction, stacking up to a total 11” of comfort. As I mentioned up top, the bed is the line’s “firm” mattress, so is designed specifically for those who want all the pressure relief of memory foam without skimping on the support. Interested to see how the bed pulls this off? Me too! So let’s dive on into its different layers. Cover – The cover is built with Tencel, an eco-friendly alternative to cotton made of regenerated wood fibers. This biodegradable material is soft to the touch and fantastic at both absorbing and wicking moisture away from the body. Comfort Layer – Below the breathable cover, you’ll find 3” of gel memory foam. This thick layer of gentle foam has a slow response to pressure, allowing the sleeper to sink in for some deep body contouring. While memory foam has a bit of a reputation for overheating, BedInABox employs a special open cell design in its foam to allow for more breathability and cooling throughout the mattress. Foundation Layer – Making up the bulk of the bed is this 8” section of high-density poly foam. This material mitigates the sinkage of the memory foam up top, giving the mattress its durability and shape. It’s also designed to support and correctly align your spine for improved comfort. After taking a look at the construction of the Tranquillium, let’s chat about the firmness and feel. 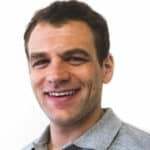 I started off by applying light hand pressure to the mattress and found that I was immediately interacting with the soft memory foam comfort layer. I could really feel myself sinking into this section, with the gentle material conforming easily to my hand. Pushing in further, I encountered the firm base, which prevented me from sinking too far into the structure. Since people of different sizes, shapes and weights are going to feel firmness differently, I decided to bring in three other folks to help me figure out how firm the Tranquillium is. We each took a turn lying on the mattress, gave it a personal firmness rating and then compiled said ratings on the graph below. 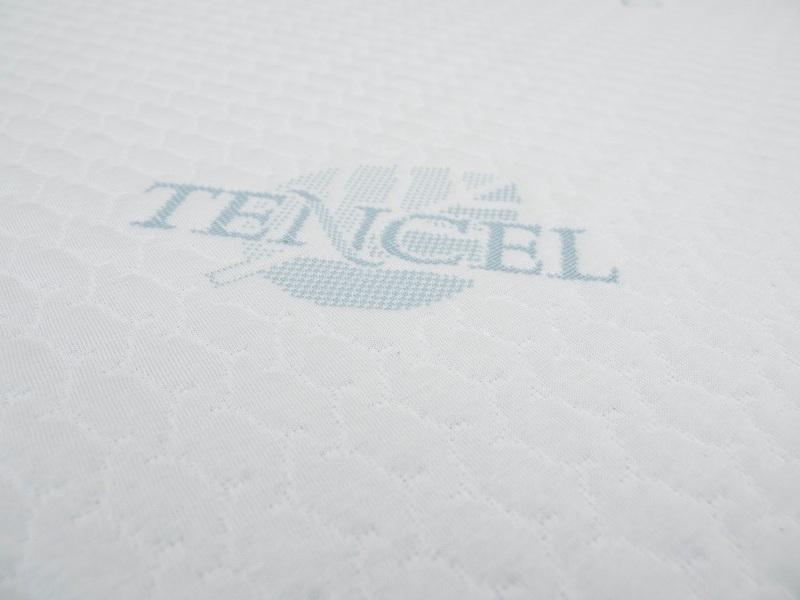 While feel is always going to be an individual thing, our responses should give you a better sense of the firmness range you can expect from the bed. As you can see in the graph above, my testers were pretty much in agreement about the firmness of the Tranquillium, giving it an average rating of 5.75. When compared to the industry standard of 6.5 for medium firmness, it’s clear that this is a fairly soft bed. I personally gave the mattress a 5.5 as I found its thick layer of memory foam provided me with a lot of pressure-relieving comfort. While it’s true that the base is firm and does at some point counteract the sinkage of the soft top layer, you’re still likely to experience a lot of satisfying contouring before it does. That being said, I think the Tranquillium could be a great pick for side or combo sleepers who need a little extra cushion at the shoulders and hips. Interested in a memory foam mattress? Check out some of my faves! Continuing our exploration of feel, let’s talk a bit about pressure, or more specifically where pressure points are likely to form while lying on top of the Tranquillium. 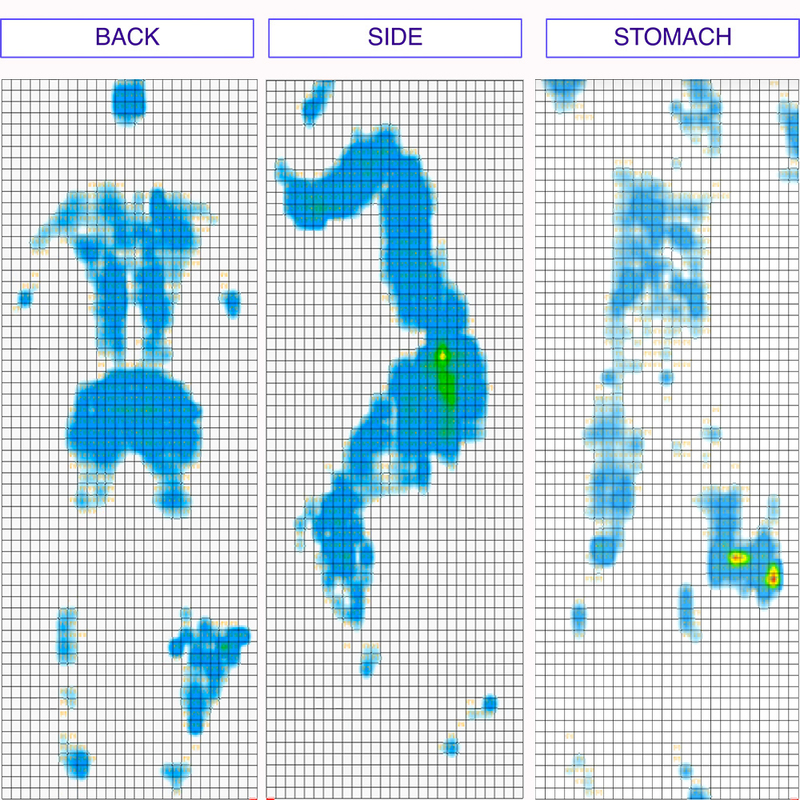 To demonstrate where these pesky tensions spots might crop up, I placed a pressure map on top of the mattress and lied on my back, side and stomach. You can see the results on the image below where pressure is represented from blue (low pressure) to red (high pressure). Back – Lying on my back, I could feel myself sinking quickly through the memory foam comfort layer. This material did a good job of filling in the space at my lumbar region, providing me with some pleasant relief. Even for this sinkage, I didn’t feel stuck in the bed and was able to change positions fairly easily. Edge Support – Scooting all the way to the side, I noticed some deep compression through the top layer, but nothing that made me feel like I’d roll out of bed. The high-density poly foam in the base kept me buoyed on top of the structure and made me feel secure at the edge. Side – Rolling onto my side, I continued to feel some great relief from this mattress. Interestingly enough, I experienced the bed as a bit firmer in this position than I was expecting, mostly because of the lack of any transition-type layer. 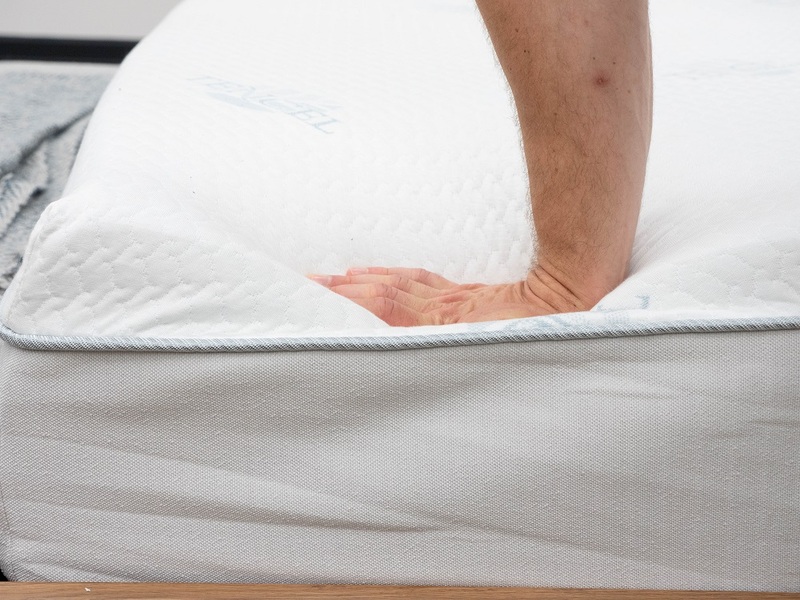 While you’ll mainly be interacting with the memory foam on your back, once you turn onto your side, the increased pressure is going to cause you to sink through this comfort layer and into the firm base below. The absence of a transition between the two sections felt a bit abrupt in my opinion, and may not be ideal for strict side sleepers. Stomach – Since I found this mattress to be an overall softer structure, I experienced a bit of discomfort in this position. Stomach sleepers tend to prefer firmer beds as they keep their spines in an even line, so with the Tranquillium, I could definitely feel my hips sinking out of alignment with my shoulders. Next up, let’s get into some motion transfer, or the amount of disturbance you’re likely to experience from one side of the bed to the other. While this test will be important for everyone, it’ll be especially pertinent for those of you who sleep with a bed mate as it’ll key you into just how badly their midnight movements are going to bother you. 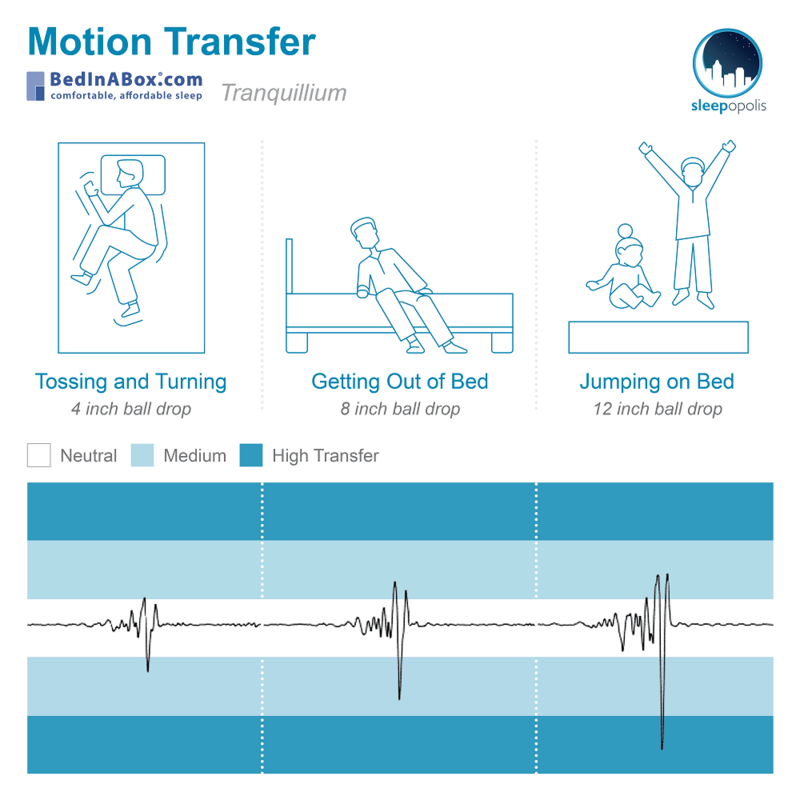 These are pretty awesome motion transfer results and tell me that you won’t be too disturbed by your partner’s tossing and turning in the night. The thick layer of memory foam is the real star here as the material actively works to absorb and dampen motion throughout the structure. Given these readings, I’d say the Tranquillium could be a solid pick for couples! To wrap up our investigation of the Tranquillium’s feel, let’s ponder its sinkage for a moment, which will tell us whether or not you’re likely to feel as though you’re sleeping “in” or “on top” of the mattress. In order to visualize this sinkage, I placed four balls of varying sizes and densities (a 6 lb medicine ball, a 10 lb steel ball, a 50 lb medicine ball, and a 100 lb medicine ball) on the mattress and measured how much they compressed the surface. These results are consistent with sinkage rates from other all-foam mattresses on the market, which means you’re likely to sink into the Tranquillium quite a bit. However, because of its quick transition into the firm high-density poly foam base, you’re not likely to feel too stuck in the bed. If you’re convinced the Tranquillium is the right mattress for you, the size and pricing information for the mattress are below. Please note that these prices reflect standard pricing, but coupons are often available. 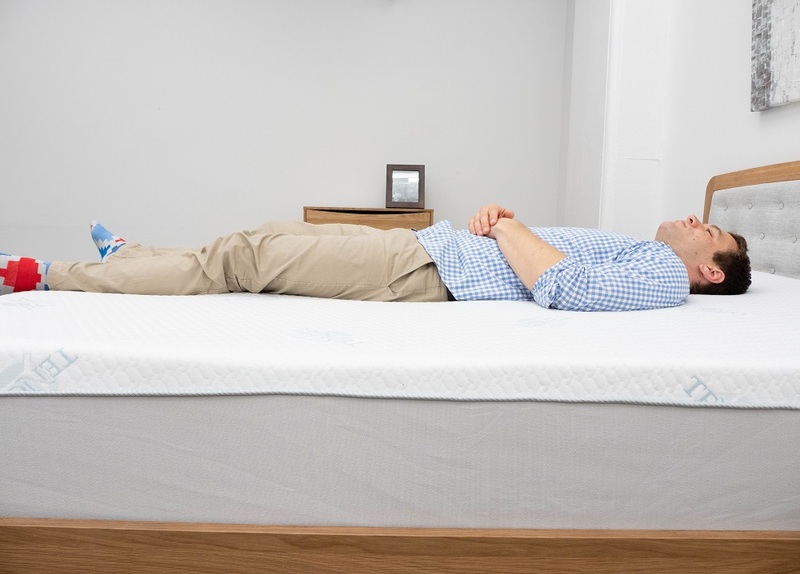 IS THE TRANQUILlIUM MATTRESS RIGHT FOR YOU? 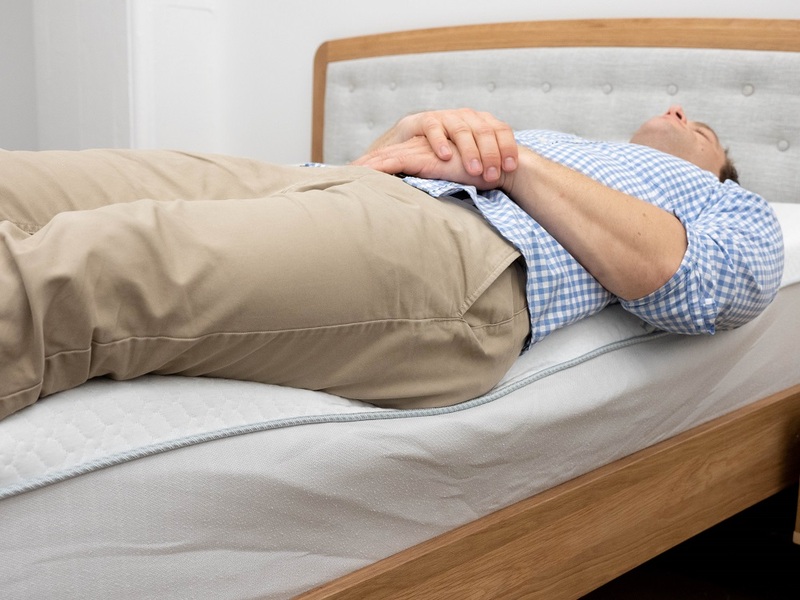 One of the biggest selling points for the Tranquillium is that it’s a memory foam mattress that also sleeps cool, which could be great for anyone with a preference for the material but not for its typical overheating properties. Given its impressive motion transfer results, I’d also say this could be a great bed for couples! And finally, I think the balanced foam feel here will really work for combo and back sleepers who want support, but also some cushiony relief. On the other hand, I’m not sure this mattress would be as great for stomach sleepers as the thick memory foam layer up top sends the spine out of alignment in this position. I’d also note that the quick transition from the memory foam comfort layer into the firm base can feel a bit abrupt depending on your preferred sleeping position. For more information on the Tranquillium, visit its website here!